Until recently the only game in town to build an M3A1 Scout Car in 1/35 scale was either one of the Zvezda or Italeri kits, both of which are based on the ancient Peerless-Max molds and required quite a bit of work for a good representation. No wonder a new molding of this important vehicle was high on the list of many modelers, including me. Hobby Boss’ release came as a surprise to me and so far has not gathered a lot of (if any) publicity. Reason enough for me to write this review. 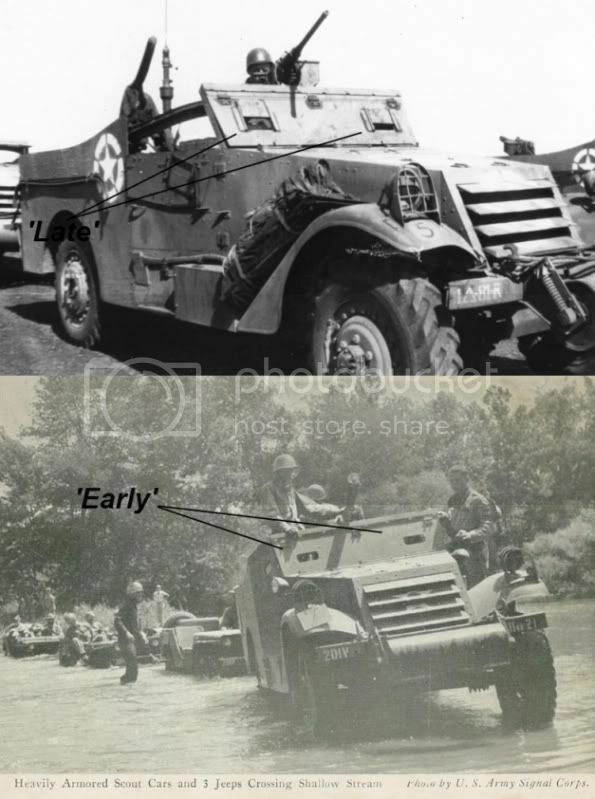 The M3A1 Scout Car was the first mass produced armored car of the United States. It was basically an M3 with widened crew compartment, the M3 itself being a modification of the M2 Armored Car of the mid 1930ies. 20894 M3A1 were produced from 1939 to March 1944 and more than half of these were provided via lend-lease to the UK, USSR and China. Period photos also show them in the markings of other nations, in particular France. Its first combat action was in the Philippines in 1941/42 and though considered obsolete by the end of the North African Campaign in 1943, it nevertheless soldiered on in the US Army and other nations in second line duties and to fill gaps where ever necessary. The M2 and M3 halftracks were based on this vehicle by substituting the back axle with tracks. The car was often referred to as the “White Scout Car” after its main producer. This however was never an official designation. Standard armament consisted of one .50 cal and two .30 cal machine guns on a skate rail running along the entire fighting compartment. In the early days the .30 cal were water cooled – there are even pictures with water cooled .50 cal – this was later changed to the standard M1919A4 .30 cal. Another distinguishing feature of early M3A1s is the missing jerry can racks in front of the driver/co-driver position (as seen on halftracks). Instead the early M3A1 has an additional search light on either side. Early M3A1 were mostly seen with directional tire treads on civilian rims whereas this was later substituted with NDMS pattern and combat rims. This layout and change was the same with the halftracks. The kit comes in a relatively small box which is packed to the brim. The box art shows an M3A1 in training with the crew in typical early Infantry gear and early markings. In the back is a typical farm in the continental US and this indicates that it depicts a scene from one of the big war games of 1940 or 1941. Packaging is excellent with each sprue in individual plastic bag and some of the finer parts wrapped in a layer of foam for additional protection. Though the box arrived in a somewhat less than mint condition from China, the parts were all undamaged. There are 8 sprues in tan colored plastic, with one of those twice (for the wheels and seats). A small PE fret, decal sheet and clear sprue complete the set. Instructions are easy to follow line drawings in 24 clear and easy steps with painting instructions printed in color on glossy paper. Markings are provided for two versions. Unfortunately there is no information on what units or even countries are represented. The first is the one on the box art from one of the war games before the start of the war in plain OD. It has the very interesting “inverted early Air Force star” markings (red circle with white star and blue circle in the center). The second option is obviously from a New Zealand unit judging from the white on black feather. It has a camouflage pattern of black over OD. Overall molding quality is very good with no flash, no sink marks and hardly any pin marks where they can be seen or if they can be seen they will be easy to fill. Construction starts with the full engine which has good detail, including a PE radiator propeller and as always leaves room for super detailing. This is certainly an option as the hood panels are molded separately and can be left open. Unfortunately, there is no radiator, so one will have to be found elsewhere. The chassis is a one piece affair and incorporates the fenders and running boards including tread plate pattern. The muffler has no opening in the end but this can easily be drilled or left as is since the muffler end is well hidden under the vehicle. The spring leafs are nicely molded though they seem to be on the thick side when compared to photos of the original. The axles are also well molded and the drive shafts are composed of several parts. The wheels cannot be modeled in a steering position but this can probably be modified if one wants this. The wheels in the kit are the later style combat rims with standard tread. While this is accurate for a later version, it is not the kind most commonly seen on the early M3A1 as in the marking options provided. On the other hand, basically any combination of rims and tires can be seen in photos so one will have to pay attention to photos of the vehicle one wishes to model. There are wheels available by Hussar for the halftrack but two sets will be needed for a full scout car. The wheels provided are finely detailed down to the valve and conform well to the original. And, yes, there is some bulging on the tires which some will like, others won’t. In my opinion it is subtle enough to be realistic and as fortunately the rims and tires are separate, the valves will not be in the same position on all four wheels (as is the case with the DML halftracks). The unditching roller on the front bumper is a bit too wide and its diameter too large and some may wish to replace this with a leftover item from a DML halftrack which should fit with some modification. Incidentally, the mounting springs on the DML version are somewhat smaller and have slightly different angles than the HB ones and comparing to photos I would say the DML items are more accurate. The interior has a one piece floor with the correct tread plate pattern. To this are added the bucket seats and cushions, the latter unfortunately have no detail and are best replaced with your own sculpted putty or any other method you find useful to get some life into them. The rest of the interior is straight forward and conforms well to available plans and pictures of the vehicle. The driver’s compartment has nice details including pedals from plastic and the dashboard is well detailed and no less than 9 decals are provided for it. There is also the antenna mount in the middle of the compartment but no radio is provided. The skate rail along the fighting compartment is made of three main parts, separate mounting points and is a nicely detailed affair. Moving on to the side and rear panels, these are nicely detailed inside and out and have the correct screws on the outside. Stowage points are molded onto these parts and some may wish to replace these with wire to make them “useable”. The side and rear panels themselves are on the thick side compared with the original and also with the DML halftracks. The rear plate has the bumper added with nice details, though the details on the rear lights are a bit on the soft side. A one piece .50 cal tripod is attached to the rear plate which looks very good considering it is one piece. There are also two one piece .30 cal tripods which unfortunately are molded as bipods with one arm missing. As these don’t seem to be the standard tripods they could prove to be hard to replace. As mentioned before, the hood parts are provided separately so can be modeled in the open position for a view of the engine (though many will consider them too thick for this). Driver’s compartment doors are provided separately with the option of opened or closed armored top. Unfortunately handles on the hood as well as the door handles are molded onto the parts and lack detail. While the handles on the hood can easily be replaced with wire, this could prove more difficult with the door handles. The upper armor flaps for the doors have the visor molded shut with no option of an opened position unless you’re prepared for some scratch work. The windshield has nice details with clear windows and separate wipers, though some may consider these too bulky and may want to replace them. The armored cover can be build open or closed. Unfortunately, again the visors are molded shut so the “up” position for the whole armor piece is really the only option. The armored radiator can be molded open or closed, with the former only being an option if you can find a suitable radiator. The louvers are plastic items and quite thick. Unfortunately it will be hard to replace these with leftover PE items from a DML halftrack as the dimensions are slightly different. The headlights have clear lenses while the searchlights on both sides of the driver’s compartment don’t, which is quite odd in my view. The headlight brush guards are the correct type but unfortunately quite thick in molding and if you have a spare from a DML halftrack you might want to use that. There are also 4 (!) convoy lights behind the brush guards, photos of the original suggest one on each outer side. Tools are quite nice with straps though not as finely detailed as other manufacturers’. The final step of the construction is the addition of the armament with nicely detailed carriages made up of 7 parts each. These should be movable once attached. The guns themselves look okay, especially the 2 water cooled .30 cals with two part cradle and four part ammo box. Unfortunately there is no provision for the water canister. The .50 cal is interesting in that it has the early longer holes in the cooling jacket, the early ammo box and the now standard drilled out muzzle (which incidentally the .30 cals don’t). Unfortunately the cradle is incorrectly molded as one chunky bit on the gun instead of the two parts it really was which would better be represented with PE. A word on decals and PE: The decals are well printed with correct registering and the colors are of a high resolution. The PE fret contains 15 parts in all, of which 8 are not used. Some of those are for the jerry can racks not used on the early version so this would indicate a later version to appear in the future. A short comparison with the ancient Peerless Max / Italeri / Zvezda kit is in order here. I had on hand for this review an old built Italeri example and its instructions. The Italeri kit obviously represents a later model with the jerry can racks and regular air cooled machine guns. On the other hand it has the civilian rim and standard (not directional) tires which would suggest an early variant. A general detail comparison shows some much improved details on the new kit such as the screws, skate rails, MG carriages, engine (Italeri’s doesn’t have one), the option of an open hood and generally the chassis and underside. Some notably positive aspects of the Italeri kit are the inclusion of the radiator, opened vision slots in the windshield armored cover and the detail of the seat cushions. Even though the Italeri kit is still quite respectable for its age, it is notable that the molds have been around a while and the molding quality is according. With this new release the calls of many modelers have been answered and it is time to send the ancient Peerless Max molds into retirement. Unfortunately the new kit is not all one could wish for with a mishmash of great details – such as the screws, dashboard, engine, machine gun carriages – and some oversimplified parts – such as the .50 cal MG, seat cushions, handles, stowage attachment points. It is unfortunate that this early version doesn’t have the more appropriate early wheels and I would have appreciated a radiator, some water cans for the water cooled machine guns and a radio. Overall I can recommend this kit but it will need some TLC to make it a show stopper. But isn’t that all the fun in our hobby? Highs: Finally a new M3A1 Scout Car! Fully detailed engine, interior detail, correct screws, machine gun mounts. Lows: Missing radiator, water cans for the MG, handles molded onto the parts, late pattern wheels, some chunky detail, no detail on the seat cushions. I'll build just about anything military related that gets my interest, though most of it is 1/35 scale WWII Allied. Copyright ©2019 text by Stefan Halter [ DANGEROO ]. All rights reserved. But those are the 'late' style combat rims, which the kit comes with. I believe the guys were looking for the 'early' style automotive rims. * I have this kit and the only thing in it that is 'early' is the two spotlights, everything else is the same as the 'late' vehicle. (machine guns notwithstanding) I'm not sure why one would want to wait for the late version, unless it was to purchase this kit at a discount. Most of the jerrycan brackets come in the form of PE, all you would have to do is scratch build the stand off part. Having said that, Jerry can brackets do not make it a late vehicle, there are countless photos of late model M3A1's without Jerry cans. In order to make this truly an early, you have to scratch build (or convert) the windshield armor. Ah, thanks Ken. I keep getting Late and Early stuff mixed up in the discussion. Those late wheels are the only ones that I am aware ATM. Hussar's usually pretty good about releasing stuff that's wanted, although nobody has released the SdKfz 222 wheels in resin yet. Of course we may have to wait for an "Early" version of the M3A1 kit to be released before any of the manufacturers consider it. It's hard to say sometimes. You make an excellent point about the wheels, however although there are AM products to replace them (and not just Hussar) this happens. Part of the problem is the source material for the research on the model. We have to assume that the detail research was done on a preserved example. In this case, the probability was undoubtedly that it was fitted with later (possibly H/T wheels). In my opinion, this ISN'T a defence as the Workshop Manuals are VERY easy to come by and do cover the wheel types in HUGE detail. Another trap for the unwary on the M3a1, is here in Europe. Many of the M3a1s in private ownership are ex-French. This creates a problem as virtually all of these involved a major restoration as when the French Govt put them onto the market, the armor plate was cut off them to avoid them being exported to regimes not in France's good books... In the States, privately-owned M3a1s are all ex-U.S. Army, in Britain, a handful are true 'originals'. I Should have access to one of these over the summer if anyone needs pics..
Stefan, I hope you didn't get the impression I was dogging your review, it was very thorough and you put a lot of work into it. Heck I'm not even dogging the kit, I'm chuffed to see it materialize. I bought a bunch of those Hussar wheel sets when they first came out but I am under the impression that they are currently out of production? I could be wrong on this though. The Kiwi markings are for a vehicle from C Squadron of the NZ 20th Armoured Regiment near Triests in May of 1945 ( these look to have been taken from the Bison 20th New Zealand Armoured Regiment in Italy set - BBD35096 ). It's a silver fern, not a white feather for the new zealand vehicle. Although to be fair it is probably represented by white on the marking, it is still a fern and not a feather.